People often ask: “Heidi, how did you ever become involved with clay?” I loved to play in the mud as a child and frankly still do to this day. My first pottery class came at age ten, at the University of Rochester, NY. The difference now is that my mud is porcelain. Upon graduating from Skidmore College, with my junior year in Paris at the Sorbonne, I couldn’t wait to go back to Europe to hike, ski and travel. I worked part time for the American College of Switzerland and ski instructed in the idyllic mountain town of Leysin, Switzerland – two heavenly jobs. After a year, I figured it was time to come back to the States. New York City beckoned. It worked fabulously for Frank Sinatra, so I figured I’d succeed there, too. I landed a great job with Sotheby’s Art Auction House, in the Chinese and Japanese division. 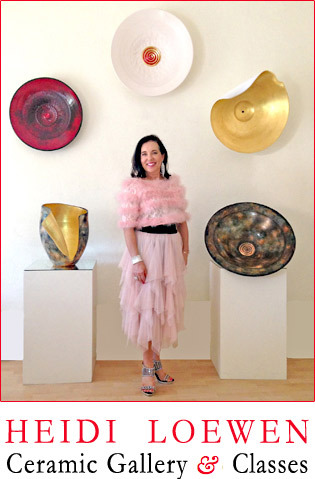 Many years later, I was asked to help curate a private art foundation and collection in Boston. While curating the art foundation, my fingers itched to work again in porcelain. So I enrolled in my off time to Harvard University’s Ceramic department in Cambridge, one of the most advanced ceramic studios in the world. What a creative blessing. And so I learned what one can do with beautiful mud…and I’m still learning!